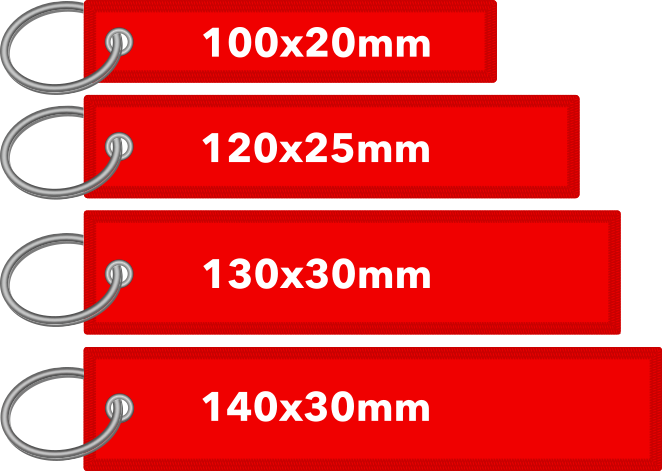 The red tags used in aviation in the form of a ribbon and placed for the control of the sensitive points of the aircraft, provides excellent visibility in the form of a goodies key ring. In facts, they are easy to carry, useful (who does not have keys ?) and are fully personalized as you can choose the thread colors (for the text and the logo embroidery), the color of the twill (background and border), the size and the attachment. Custom sizes are possible to make, please contact us for any inquiry. There is an extra cost for reinforced attachment of +0,15€(0,15$) by unit. In most cases, this embroidered or woven fabric keychain is rectangular in shape, with a crimped eyelet and a metal ring that is used to insert the keys of every day's life. You have basically 2 main choices of fabric : woven and embroidered keychains. The embroidery is the most common method used for red tag manufacturing but it's up to you! Woven is great for complex images with many details on it. The rendering will be much better with woven as it will use only one thread "flow" for the whole process, even if there're many colors; while embroidery will use as many thread flows as there are different colors, so we'll have several "layers" that will give a embossed result.